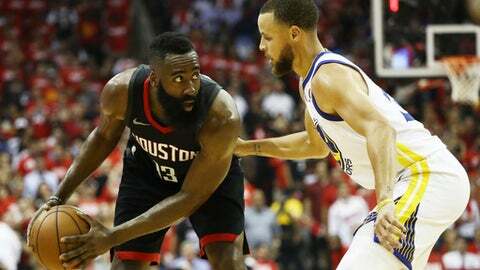 HOUSTON (AP) Chris Paul’s grit and veteran leadership have pushed the Golden State Warriors to the brink of elimination. ”We haven’t been in this position before … so it’s a chapter we need to figure out and finish the story,” Stephen Curry said. Warriors: Coach Steve Kerr was unsure Thursday if Iguodala would be able to return for Game 6. ”He’s dying to play, but he’s not healthy enough,” Kerr said. ”We’ll just continue to take it day to day.”… Curry made four free throws to tie Rick Barry for most free throws made in the playoffs in franchise history with 378. … Golden State had 18 turnovers. The Rockets honored the 10 people killed in last week’s school shooting in Santa Fe, Texas, before the game, with the school’s choir singing the national anthem and team owner Tilman Fertitta wearing a ”Santa Fe Strong” T-shirt, before Houston scored the game’s first six points in a first half where the team led by as many as 11. Houston also wore rectangular patches on its jerseys that read: ”Santa Fe HS,” to remember those affected by the tragedy. ”We wanted to come out and give them light, put smiles on their faces (and) clear their minds a little bit,” Harden said.